So at my day job, a colleague brought cupcakes in for a birthday celebration. They were so good, I begged her for the recipe so I could share it with all of you. Yes, they were that good. They were a perfect reconstruction of a hearty breakfast – buttermilk pancakes, bacon, and maple syrup. They didn’t taste like dessert – they literally tasted like a plate of pancakes and bacon with maple syrup. Uncanny. 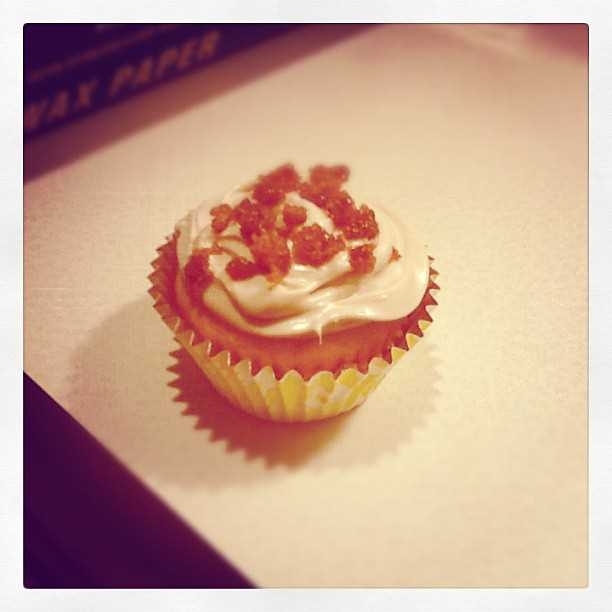 The pancake cupcake was a stroke of genius; the frosting was surprisingly light and delicate, not dense and overpowering. And the sweet and smoky bacon on top was the icing on the…well, you know what I mean. I really expected it to be too sweet with all of those sugary components, but it was just right. Thank you Deb! Enjoy. Preheat your oven 350 degrees F. Mix all ingredients until blended. Fill lined muffin or cupcake tins. Cook for approximately 20 minutes or until your tester comes out clean. Set aside to cool. Beat the softened butter, cream cheese, brown sugar and salt in a medium-sized bowl until fluffy. While you continue beating, add both the maple flavoring and the vanilla. Slowly add the confectioner’s sugar and gradually increase the speed to high. Continue beating until the icing is fluffy. Chill the maple-butter frosting for one hour before using. Preheat oven to 400°F. Line rimmed baking sheet with foil. Place rack in center of foil. Dredge bacon slices with brown sugar and lay on rack. Bake until sugar is melted, about 8 minutes. Turn bacon over and continue baking until bacon is deep brown and glazed, 12-14 minutes longer. Remove from oven. Cool bacon completely on rack. Cut into 1/4-inch dice or crumble. Here at the MHK, we love to find simple recipes that don’t take much time to prepare, but are extremely delicious nonetheless. Today’s recipe isn’t necessarily simple, and needs a bit of time to make, but the end result is a truly amazing dish. It’s hard to believe there is a Rick Bayless recipe that we hadn’t made, but we found one. 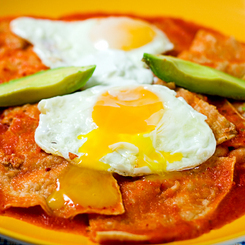 We posted another recipe for chilaquiles a while ago, but that recipe is more like a Mexican lasagna than authentic chilaquiles, which is a traditional Mexican breakfast dish (but they’re great for any meal). Bayless’ recipe uses guajillo peppers, which are dried Mirasol peppers – both are widely used in Mexican cooking; they have a mild flavor and are used primarily in sauces. By toasting them and then rehydrating them, the smokiness of the flavor comes out nicely. Chances are you can find these in your area (we found them in Albanyof all places). Mexican crema may also be readily available in your area, but we thinned out some sour cream with a little water and it was great. We skipped the step about straining the sauce before cooking it and it turned out fine (but using a good food processor helps). The egg is a critical component – the runny yolk imparts great texture to the dish. Next time we will add some heat to the dish; it definitely would benefit from some spicy addition. This is comfort food at its finest. We served it with some watermelon for a complete meal. Enjoy! Toast the guajillo pieces a few at a time in a dry heavy skillet or on a griddle heated over medium, pressing them flat against the hot surface with a metal spatula until they are aromatic, about 15 seconds per side. In a bowl, rehydrate the chiles for 20 minutes in hot tap water; keep the chiles submerged. Use a pair of tongs to transfer the rehydrated chiles to a food processor or blender. Measure in 1 cup of water; add the tomatoes and garlic and process to a smooth puree. Press through a medium-mesh sieve into a bowl, if desired. Heat 1½ tablespoons of the oil in a medium (4- to 5-quart) pot or Dutch oven or a large (12-inch) deep skillet over medium-high heat—you’ll need a lid for whichever vessel you choose. When hot, add the chile puree and stir until nearly constantly until reduced to the consistency of tomato paste, about 7 minutes. Add the broth, partially cover and simmer over medium-low heat for 20 minutes. Season with sugar and salt. Heat the remaining 1 tablespoon of the oil in a large skillet over medium. Add the eggs and cook on one side just until set, sunny-side up. Raise the heat under the seasoned sauce to medium-high. Stir in the chips, coating all of them well. Let return to a rolling boil, cover and turn off the heat. Let stand for no more than 4-5 minutes. Uncover the pot and check that the chips have softened nicely—they should be a little chewy, definitely not mushy. Spoon onto plates; drizzle with the crema (or thinned out sour cream), strew with the sliced onion and dust generously with the cheese. Top each portion with an egg and serve right away. Eat! I never thought I would learn about new foods from a supermarket magazine, but the Hannaford one has done just that. Their latest issue features this recipe for ejjeh (pronounced “edgy”), a delicious treat from the Syria/Lebanon area of the Middle East. 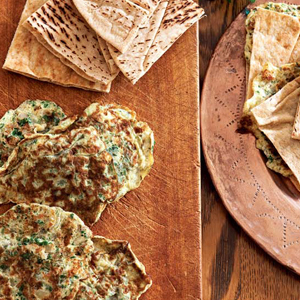 These are basically egg “pancakes,” or mini-omelets, and they are packed with fresh flavor. The tang of the onions and the aromatic parsley and mint make for a fresh, vibrant taste, with the chewy pita bread lending great texture. It was suggested to serve these with yogurt or hummus – we chose yogurt. I made a cucumber-less tzatziki, and it elevated the dish to a new level of deliciousness. Serve this with a fresh salad and it’s a unique twist on brunch, lunch, or even dinner. Enjoy! In a medium bowl, whisk together eggs, onion, parsley, mint, garlic, milk, salt, and pepper. In a large nonstick skillet, heat 2 tbsp. of the oil over medium-high heat until very hot. Spoon about 2 tablespoons of egg mixture into the pan, making 4 “pancakes” per batch. Cook until the bottoms are lightly golden, about 30 seconds, then turn and cook the other side for 30 seconds. Transfer pancakes to a plate. Repeat with the next batch, adding more oil as needed. To serve, place one pancake in a pita quarter and place on a serving platter. Eat! Today’s recipe is short and simple, but your taste buds will thank you for taking the minimal amount of time and effort to make it. It’s little more than an omelet, but it takes on a whole new dimension of flavor with the mere addition of an item not usually associated with omelets: jam. We saw a recipe at some point for a tea sandwich consisting of camembert cheese with fig jam. It was this that inspired us to create the dish presented today. We used the eggs as the serving vehicle for the camembert (or Brie, either will be fine) and blue cheese; the savory qualities of the eggs and cheese is a natural match for the fig jam. This could almost be considered a dessert – heck, serve it as such if you want, nobody will complain. The cheeses give the dish a rich component; we served it with strawberries to balance it out, and it worked perfectly. Enjoy! Heat oil in a skillet over med-high heat (if using a really good non-stick skillet, you can cut down or omit the oil). Lightly beat eggs with the pepper. Add to skillet; let the bottom set. Flip omelet over; top half with the cheeses. Fold other half over the cheese-topped half; flip once and then plate. Slice omelet in half. Top each with a 1 tbsp. 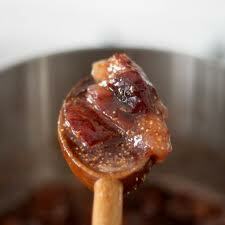 dollop of fig jam. Eat! It’s amazing how sometimes the simplest dishes turn out to be so utterly fantastic that you just have to blog about them. And so here we are! 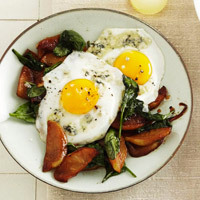 This recipe, from Better Homes and Gardens magazine, has four basic ingredients: eggs, spinach, apples, and blue cheese. The combination is super delicious, and the recipe is very easy and takes very little time. The sweetness of the honeyed apples offsets the bitter spinach nicely, and of course adding blue cheese to just about anything is ok in our book. I accidentally overcooked the eggs a little – make sure you leave the yolk just a bit runny, as it will add great dimension to the dish. 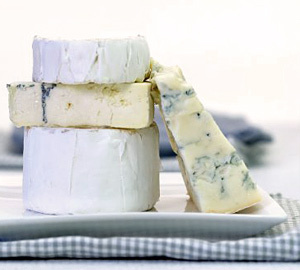 If you’re not keen on blue cheese, goat cheese would be good too. Serve it with some multigrain bread and it’s a very healthy and very tasty dish, perfect for brunch (or any other meal, really). Enjoy! In a large serving bowl place spinach; set aside. In a very large skillet cook apple slices in 2 tablespoons of the olive oil over medium heat for 3 to 4 minutes or until tender. Stir in balsamic vinegar and honey and cook for2 minutes. Add apples to spinach in serving bowl; toss to just combine and slightly wilt. In the same skillet heat remaining 1 tablespoon olive oil over medium heat. Break four eggs into skillet. Sprinkle with half of the blue cheese, 1/8 teaspoon each salt and pepper. Reduce heat to low; cook 4 to 5 minutes or until whites are set. For more doneness, cover the last 2 minutes. Repeat with remaining eggs and blue cheese. Divide spinach and apples on to plates. Place two eggs on each serving. Eat! A neighbor asked us the other day where the best Mexican food in the Albany area was. Without hesitating, I replied, “In my kitchen.” Now I realize that sounds arrogant and boastful, but the fact is that while a couple of decent places exist, the food is very expensive ($18 for tacos!) and since I began my torrid culinary love affair with Mexican food master Rick Bayless, I don’t think my claim is far from the truth. Case in point – today’s recipe. 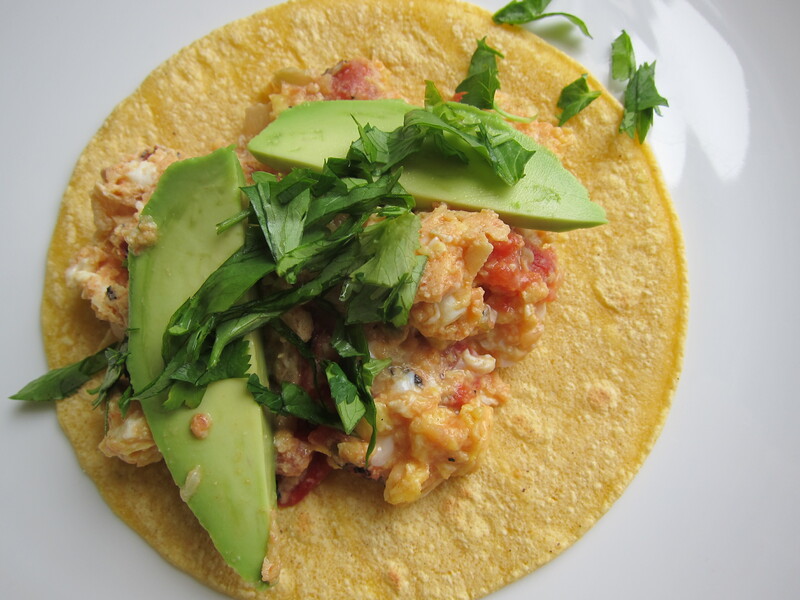 As Master Bayless explains, eggs are a natural match with the Mexican flavors of onion, tomato, chilies and cilantro. Roll that into a warm corn tortilla, and you have a slice of authentic Mexican food heaven. The avocado is a particularly nice touch, adding a layer of buttery creaminess to the dish. We recommend either making your own salsa (one of these will do), or using Bayless’ brand Frontera if your supermarket carries it. Serve these with some fresh fruit, and it’s a delicious meal, day or night. Enjoy! With a food processor or blender running, drop in the garlic and chilies one piece at a time, letting each piece get finely chopped before adding the next. Stop the food processor (or blender) and add the onion, then pulse until most of the onion pieces are no longer than ¼ inch. Heat the oil in a very large (12-inch) skillet, preferably nonstick, over medium. Add the onion mixture and cook, stirring regularly, until starting to brown, about 4 to 5 minutes. Raise the heat to medium-high and add the tomatoes. Cook, stirring frequently, until all of the tomato liquid evaporates and the oil separates out again, about 4 minutes. While the tomatoes are cooking, crack the eggs into a bowl and add 1 teaspoon salt. With a fork, beat the eggs just enough to roughly blend the whites and yolks. Pour the eggs into the skillet and cook—slowly stirring and scraping up the cooked eggs from the bottom of the skillet—until the eggs are done as you like. Scoop into a serving bowl and sprinkle with the cilantro. Serve with the warm tortillas, avocado, and salsa or hot sauce for making soft tacos. Eat! I was planning on making a very boring breakfast-for-dinner, just eggs and bagels and fruit. But the food muse embraced me about 30 minutes prior and whispered in my ear, so I changed things up and turned a boring meal into a Recipe of the Week! This spin-off of eggs benedict requires the use of the MHK’s famous pesto recipe; I added a bit more oil to it to make it more “saucy.” I used bagels in place of the traditional English muffin, and I prefer to just do eggs over-easy rather than poached, but it’s up to you. I used an aged cheddar for the cheese, but pretty much any cheese will work well. The end result is really tasty – the chewy bagel, the salty ham, the tangy tomato, the melty cheese and then the gooey egg are a great blend of textures, and the pesto adds unique flavor and depth to the dish. Serve it for breakfast, brunch, lunch, dinner, midnight snack, etc. with some fresh fruit. Enjoy! Heat oven to 350. Place each bagel half cut-side up on a baking sheet. Arrange each half as follows: 2 slices ham, 1 slice tomato, 1 slice cheese. Bake for 5-10 minutes until cheese is melted. While baking, cook the eggs to your liking (poached, over-easy, over-medium or sunny side up work best). When the bagel halves are ready, place two halves on a plate. 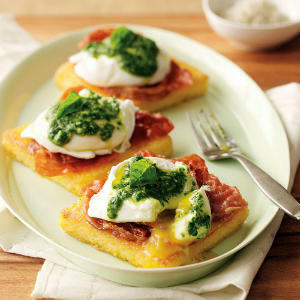 Top each half with one egg, then drizzle pesto sauce over the top. Repeat, then eat!